It started out a harmless hobby... I had no idea it would come to this. Stop wondering what else you can do with that 9 degree wedge ruler. With the ruler and 8 fat quarters in your favorite combination or seasonal print fabrics creates this eye catching table runner in one class. There are so many cute panels and more options for finishing than border, border, and border! We will look at what can be done with book panels and directional panel scenes . 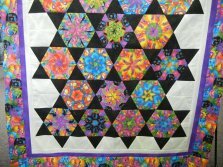 This is a two-session class, where you’ll decide what you want to do and learn how to implement your choices for a unique quilt. Put the Stack and Wack mirror to fabric and view the variety of kaleidoscope affects from one piece of fabric. Then spend a few hours and learn this mesmerizing technique you will want to do over and over again. This class puts a nice spin on a traditional block using a Creative Grids Ruler. We would love to hear from you... if you are interested in a class but need it to be in the evening or particular day... let us know. We will try our hardest to make it happen. If there is a technique or project you are working on and are stuck.... come on in we would love to help you out. Sit and sew Thursday is a great way to pick up new ideas and have some fun. Stay for an hour or stay all day.